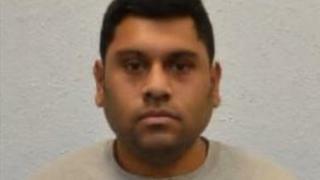 A man who used a James Bond-style USB cufflink to store extremist data has admitted five charges of terrorism. Samata Ullah, 34, of Cardiff, pleaded guilty to being a member of so-called Islamic State, terrorist training, preparing terrorist acts and possessing articles for terrorist purposes. He denied one charge of directing terrorism. The Old Bailey court in London heard the Attorney General had decided to accept the pleas. The remaining charge will lie on his file. When he was arrested on 22 September, he had a USB cufflink with an operating system loaded onto it to conceal a hoard of extremist data, including a blog. The court heard that between December 2015 and his arrest, Ullah had provided instructional videos on how to secure sensitive data and remain anonymous online with the use of encryption programmes. He also admitted having a book entitled Guided Missiles Fundamentals AFM 52-31 and an electronic version of Advances in Missile Guidance, Control and Estimation for terrorist purposes. Brian Altman QC, prosecuting, said a hi-tech report dealt with Ullah's desire to copy his blog onto a platform in a "format that meant it could not be closed down or deleted by the authorities". Ullah, who has been diagnosed with autism, admitted the charges earlier in March but his pleas could not be reported until after the the prosecution had time to consider whether to go ahead with a trial on the remaining charge. Judge Gerald Gordon lifted reporting restrictions and adjourned the case until 28 April. He said the "issue of dangerousness" would have to be looked at before sentencing. Speaking after the hearing, Metropolitan Police Counter Terrorism Commander Dean Haydon said: "Just because Ullah's activity was in the virtual world we never underestimated how dangerous his activity was. "This is just the sort of information that may have helped people involved in planning devastating, low technical level, attacks on crowded places as we have seen in other cities across the world."